Formation, class number and new livery confirmed. First Capital Connect (FCC) and Siemens have revealed the number of 12- and 8-carriage trains in the 1,140 vehicle order for the Thameslink routes that was finalised in June. 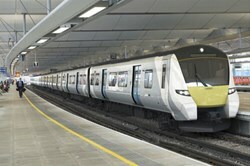 At the same time they have confirmed the smart new livery and official class number for the new fleet, which is part of the massive £6bn Thameslink Programme infrastructure and rolling stock upgrade. The Class 700 fleet, as it will be known, will have 55 trains in a 12-carriage formation and 60 with eight carriages. The eight-carriage variants will be numbered 700001-700060 with the 12-carriage trains known as 700101-700155. They will run on various train service groups being devised for the new Thameslink, Southern and Great Northern franchise. The first train is due to enter service in 2016. Both 8- and 12-carriage trains will be fixed in length. To maximise passenger space they will not have intermediate cabs and will feature wide interconnecting gangways to enable passengers to move easily through the train. First Capital Connect is playing a key role in the design and delivery of the new trains, working closely with Siemens on a design that meets the needs of both commuters and long-distance passengers, whilst meeting the specification required by the Department for Transport (DfT). FCC has also agreed with the DfT the initial livery for the new Class 700s. The trains will be light grey with pastel blue doors and a white diagonal flash at the carriage ends. It is anticipated that this livery could be retained by the eventual franchisee for the routes or treated as the basis for an alternative brand. FCC's New Trains and Engineering Director Jonathan Bridgewood said, “FCC is playing a leading role in the delivery of this hugely important order for new trains, working in partnership with Siemens to deliver outstanding new trains for the Thameslink routes. The Thameslink Programme will create a new high capacity, high frequency service of longer trains across central London. It will also link together new routes, in particular the East Coast Mainline with the Thameslink route at St Pancras International. The first phase is finished providing longer platforms on the Midland Mainline north Thameslink route (Bedford to St Pancras International) and new stations at Blackfriars and Farringdon so that 50% longer 12-carriage trains can now run between Bedford and Brighton. The final phase is to rebuild London Bridge and its surrounding rail track to unblock this bottleneck and usher in a new high frequency service of new 12 and 8 carriage trains of up to 24 trains per hour in each direction between London Blackfriars and St Pancras International.